Sossi Yerissian is a highly qualified MLD Practioner and was the first MLD therapist in the UK to take on DEEP OSCILLATION® - she has written many articles about the therapy and continues to support PhysioPod™ UK Ltd in their mission to achieve DEEP OSCILLATION® as a widely accepted, non-invasive, non-traumatic therapy for it's many clinical effects and for greatly improving the lives of Lymphoedema sufferers. Sossi has written for MLD Quarterly, a members only subscription periodical about her uses and has appeared on The Wedding Channel demonstrating its use for brides-to-be. 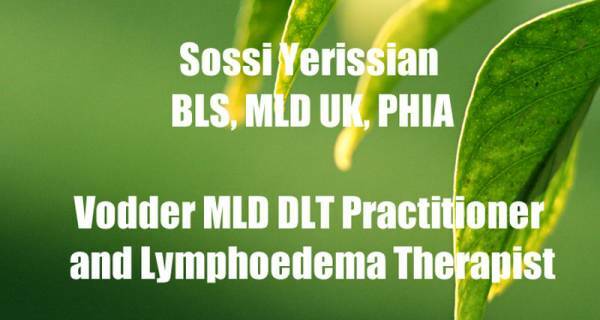 Sossi has helped PhysioPod™ UK Ltd with many exhibitions and was on stand at CAMEXPO where she successfully demonstrated to other intrigued MLD therapists. PhysioPod™ UK Ltd will exhibit again at CAMEXPO in 2011.